Advocate features a taut geometry and a concave back detail to create the proper back support, kicking out long and elegantly tapered rear legs in the process. 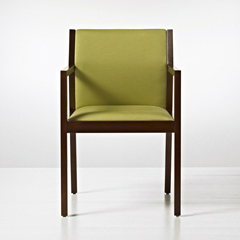 Advocate brings new life to Geiger's rich legacy of wood craft in side chairs that are at once restrained in form and crisp in execution. Geometric Advocate is rooted in mid-20th century Danish modernism, with frames made of durable solid hard maple. Wood-back, wood-halfback and upholstered-back arm chairs comprise the family.